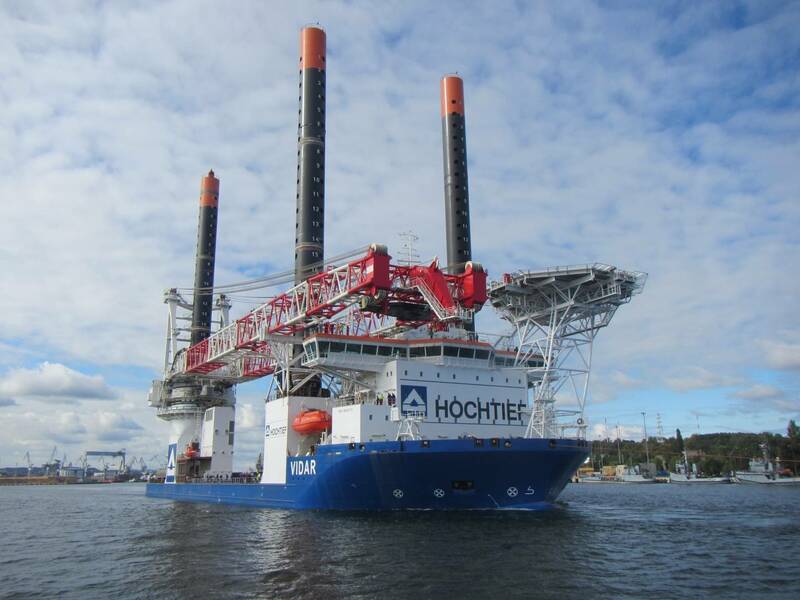 Since December 2013 the fleet of HOCHTIEF has a new member. The offshore jack-up vessel VIDAR was developed especially for construction and servicing of offshore wind farms as well as offshore oil and gas plants. The propulsion system consists of four SCHOTTEL Combi Drives electric azimuth thrusters and three SCHOTTEL Transverse Thrusters. It allows a transit speed of about 11 knots and precise maneuvering and positioning. The diesel-electrically driven ship is 140 meters long and 41 meters widewith four SCHOTTEL Combi Drives Type SCD 2020 with an input power of 2,600 kW each. The SCHOTTEL Combi Drive combines the advantages of the proven 360° steerable SCHOTTEL Rudder propeller with the economic benefits of an electric drive. The electrical steering system doesn’t need extensive hydraulic engineering and complex piping. Additionally, the SCD saves space as the motor is vertically integrated into the support tube of the thruster. It therefore has a very compact hydrodynamically optimized underwater housing. Especially for dynamic positioning the maneuverability of the VIDAR is optimized by three SCHOTTEL Transverse Thrusters STT 3030. They have an input power of 7,500 kW and are integrated into the bulbous bow with a propeller diameter of 3.2 meters. The installation vessel meets the requirements of the DP class 2 and reliably mounts wind turbines of all sizes with its 1,200 tons crane. When the VIDAR rises above sea level on its 90-meters jack-up legs it offers a secure working platform for the construction of offshore wind farms in up to 50 meters water depth. The VIDAR can accommodate 90 crew members and has a loading capacity of up to 6,000 tons. On its large deck surface of 3,400 square meters it stores for example rotor blades for wind turbines. 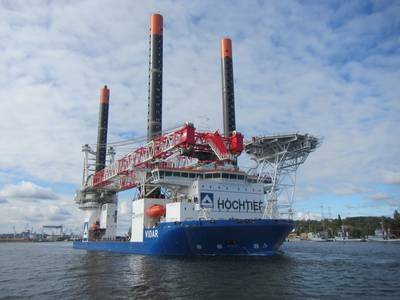 Currently, the VIDAR installs rotor stars for the wind farm Global Tech I in the North Sea, where its sister vessels THOR and INNOVATION are used for the installation of foundations, towers and turbines. The INNOVATION is also equipped with SCHOTTEL drives.